With expected infrastructure development, rise in FDI, growth in industrial segment and surging construction activities in residential segment, demand for air conditioning systems in Iran is anticipated to witness growth. Further, owing to removal of sanctions, many companies are expected to invest in the country, which would drive the growth of infrastructures. Amongst all applications, industrial and residential collectively have generated significant market revenues in the overall air conditioners market. In the coming years, significant growth in residential and energy & mining applications is expected. • Historical & Forecast data of GCC Air Conditioner Market for the Period 2010-2021F. 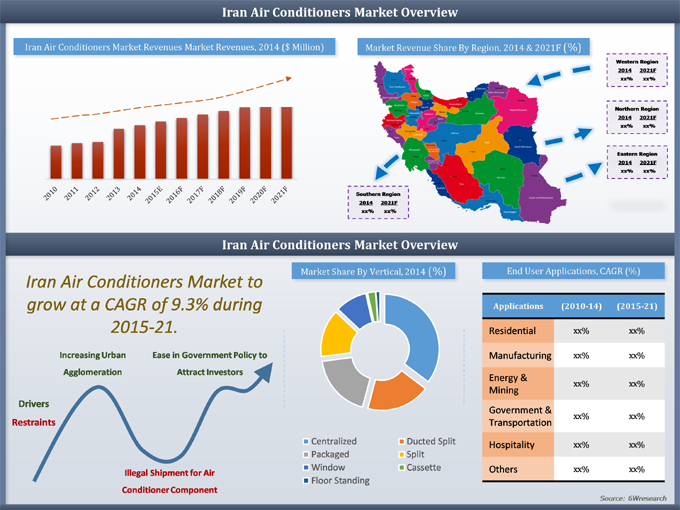 • Historical & Forecast data of Iran Air Conditioner Market Revenue for the Period 2010-2021F. • Historical & Forecast data of Iran Window AC Market Revenue & Volume for the Period 2010-2021F. • Historical & Forecast data of Iran Split AC Market Revenue & Volume for the Period 2010-2021F. • Historical & Forecast data of Iran Packaged AC Market Revenue & Volume for the Period 2010-2021F. • Historical & Forecast data of Iran Free Standing AC Market Revenue & Volume for the Period 2010-2021F. • Historical & Forecast data of Iran Cassette AC Market Revenue & Volume for the Period 2010-2021F. • Historical & Forecast data of Iran Centralized AC Market Revenue for the Period 2010-2021F. • Historical & Forecast data of Iran Centralized AC Market Revenue, By Components for the Period 2010-2021F. • Historical & Forecast data of Iran Air Conditioner Application Market Revenue for the period 2010-2021F. • Historical data of Iran Air Conditioner Regional Market Revenue for the Period 2010-2014. • Market Size & Forecast of Iran Air Conditioner Regional Market Revenue until 2021F. • Market Drivers & Restraints. 15.6 Samsung Electronics Co. Ltd.
15.7 GREE Electric Appliances Inc.
Iran is expected to witness hike in investments due to lifting up of sanctions from US. Removal of sanctions would result into increased foreign investments in the country leading to establishment of new infrastructures. Iran air conditioners market has majorly captured by intentional players, selling a wide range of products through its distributors and channel partners. With the growing demand for air conditioners in the country, majority of demand has been witnessed from centralized air conditioners followed by mini split and ducted split air conditioners.